I've never made a buttermilk cake before, and I wasn't sure how it would taste since buttermilk is rather an acquired taste. The sour flavor the buttermilk is very subtle here, it cuts through the sweetness so this ends up tasting light and not too rich. It's a nice cake for brunch or with coffee or tea. I paired the cake with Roasted Voodoo Vanilla Pineapple from Sherry Yard's brilliant book, The Secrets of Baking. I followed the pineapple recipe almost to the letter though I did omit the fresh banana from the sauce since I didn't have any at home. 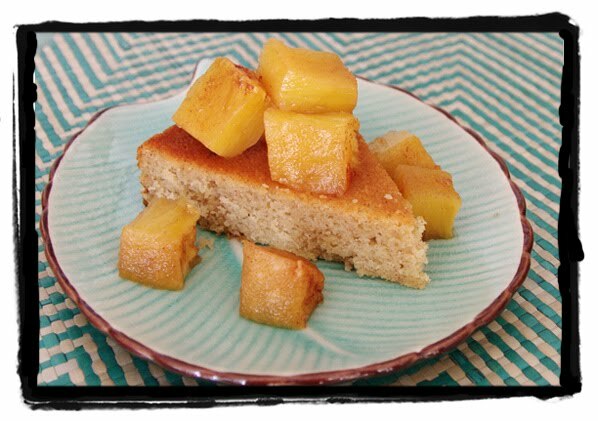 The pineapple recipe is vegan and you can eat it plain, use it over vegan ice cream, or top a cake with it as I did. Whatever you do, it's completely delicious. Preheat the oven to 375. Adjust the rack to the center of the oven. Place the pineapple in a large baking dish. Poke or push the vanilla bean pieces into the flesh of the pineapple, you may need to use a small knife. Whisk together the water, rum, sugar, ginger, and chile flakes in a medium bowl. Pour this mixture over the pineapple. Bake for 35 to 40 minutes, basting every 15 minutes, until the juices are bubbly and the outside of the pineapple is lightly caramelized. Remove from the oven and cool to room temperature. This sounds like a great combination! I like buttermilk in baked goods. oh yum! I am going to try this. I like buttermilk in cakes too. Love that voodoo magic in the pineapple going on there, Michele. Sounds like a great combo!